After budgeting all my expenses in YNAB, I would like to be able to find transactions quickly by category. I want the service I used about 1 year ago for septic pumping, for example. I believe this is best done by reporting spending detail by category (a list of the transactions for that category) over a time span and over accounts, same type of parameters as the other reports. I would use this sometimes as given in the example, but most often at tax time to look over all the transactions in my medical category to make sure they are tax detectable. I would like to have the report by April, 2019. YNAB should have this feature right now, but it is not critical. I can scroll and scroll thru transactions, not real fun. I would use this most at tax time very year, but also sometimes during the year. 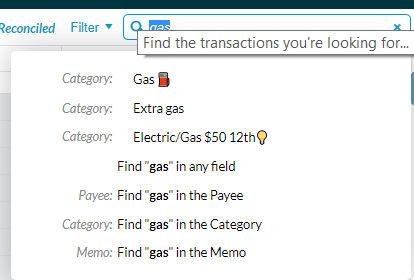 Use the search function in the All Accounts view. The Search option is in the upper right of the screen on the web app. The nice thing about using Search in All Accounts is that you can choose to look for exact category or payee matches, or anywhere in the field (or any field). adriana01 so that'd work for finding the septic service, but would show all the entries in say medical for 2018? Ben K. It would! Find "Medical" in the Category. mamster ok. I'll give it a try when I get back to my laptop. Also, this is a perfect response from the community or support. Here's another way to do what you want to do, that's the important part. Ben K. You can also search for a Master Category, so if you have several medical categories under the same Master it would all show up. adriana01 cool! Do I have to have the categories set to the master before the transactions happen? I mean, mid year can I think of a new master category, move categories to it, and then use the search feature? Ben K. Yes. Once you move a category or rename it, everything you had entered with that category is changed too. adriana01 Fantastic! It works well. Thank you! adriana01 Oh, I don't see where it adds them up. Maybe that's still a report function or something I could export to get? Ben K. Click the "select all" box at the top of the list, and the total will appear in the upper right. mamster going to start calling you the YNAB Jedi. It almost worked, but I can use it. In Dec. I was using YNAB without much training, looks easy enough. I was splitting my income into categories and skipping TBB. So, those show up too. But for 2019, it should be a clean view. Thanks! adriana01 Thank you! That now completely meets my functional request. It does not give me a report I asked for, but that my only a single solution to my issue.